Mason Jars: There is a wide variety of jar sizes and styles to meet every day needs and gift-giving occasions. Regular Mouth~ Standard home canning jars are available in half-pint, pint and quart sizes. They’re perfect for everything from pickle relish, to whole tomatoes, to green beans. Wide-Mouth~ Standard wide-mouth jars offer pint, quart and half-gallon sizes. Pint sizes can be used for sliced beets, quart sizes for peach halves, and half-gallon sizes for fruit juice. Quilted Crystal Jelly Jars~ Specially crafted with a delicate cut diamond design, these jelly jars add sparkle to any jam, jelly or preserves. They are available in popular sizes; 4-ounce, 8- ounce and 12- ounce sizes and come with decorative caps. Collection Elite Wide-Mouth~ A new look for home preserving. Both 8-ounce and 16-ounce sizes have the wide mouth opening for easy filling. Silver colored two-piece vacuum caps complete the contemporary look. Lids and Bands~ Two-piece vacuum caps, consisting of a lid with sealing compound and a screw-on band. Pickle Crisp Granules~ Makes delicious crunchy pickles and relishes at home using Pickle Crisp Granules. Mixed Pickling Spice~ This blend of herbs and spices ensures your pickle recipes have the right balance of flavors. Real Fruit Pectin~ Three types of pectin are available for cooked recipes. However, they are not interchangeable, so use only the type of pectin listed in the recipe. Classic~ Natural powdered pectin derived from fruit aids in gelling soft spreads. Use only the amount of pectin listed in the recipe. Liquid~ Comes in a box with two-3-ounce foil pouches. Each recipe will state the number of pouches to use: one or two. Use just the amount indicated in the recipe. Low or No-Sugar Needed~ Is specially formulated for select recipes. This kind of pectin may be prepared with less sugar than classic powdered pectin. Choose from no sugar or up to three cups sugar, depending on dietary need and personal preference. Fruit Fresh Produce Protector~ Protect the color and flavor of fruits and vegetables that darken when peeled or cut with Fresh Fruit. Real Fruit Instant Pectin~ This unique pectin is simple to use. Combine with crushed fruit, pectin and sugar -no cooking- refrigerate for immediate use or freeze for later use. 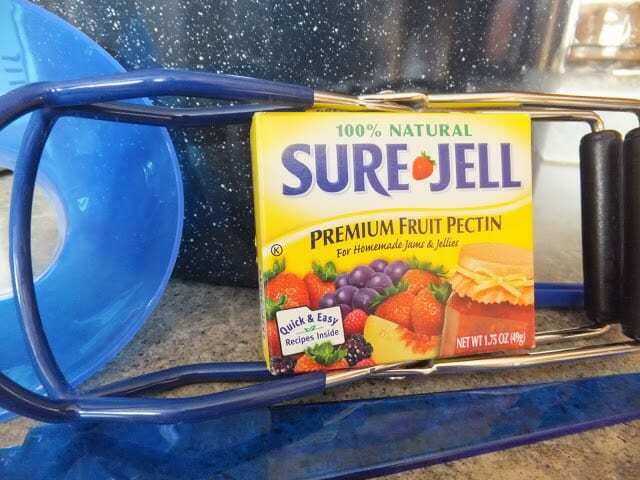 Instant jam pectin is not interchangeable with other types of pectin. Boiling Water Canner~ Boiling water canners provide the quality, features and safety needed to make each canning experience enjoyable and successful. Twenty-one quart capacity holds up to 7 quart jars. Boiling water canning is recommended for high acid and acidified foods such as fruits, soft-spreads, pickles and tomatoes. Stainless-Steel Water-bath Canner~ Features include; aluminum core based for even heat distribution, stay cool silicone handles on lid and pot, a chrome-plated rack that resists corrosion and a glass lid that lets you see the boiling water throughout the canning process. This durable canner heats quickly and has a non-porous finish for easy cleaning. Designed with a flat bottom and straight sides to accommodate any cooking surface. It comes equipped with a tight fitting lid and chrome plated corrosion resistant rack. Bubble Remover & Head-space Tool~ A flexible tool with gradations on one end to accurately measure head space and tapered on the other end to remove air from inside the filled jars. 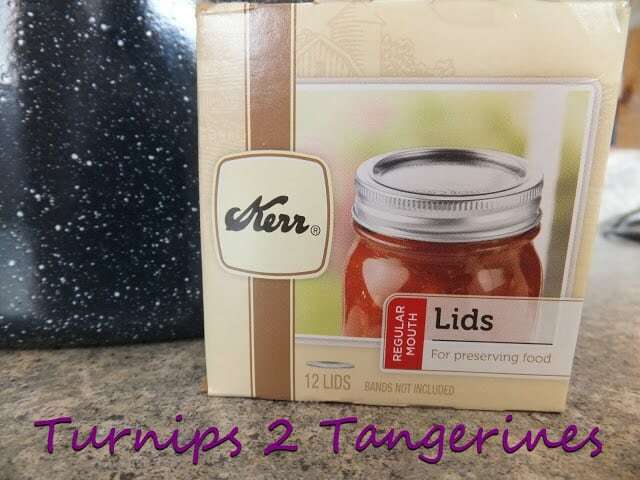 Jar Funnel~ A plastic jar funnel having a wide opening that fits regular and wide mouth canning jars makes filling easy and quick.The translucent plastic lets you see the fill level so there are no mishaps to clean. Jar Lifter~ Hot jars can be safely removed from the canner with large sure-grip tongs. These tongs handle any size regular and wide-mouth jars. 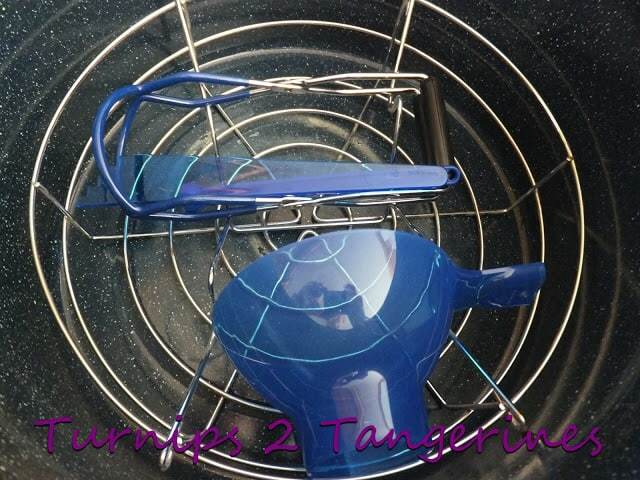 Lid Wand~ This handy utensil has a magnetic tip for removing lids from hot water. Dis-solvable Labels~ Dis-solvable labels adhere securely on jars or lids during storage and use, but dissolves easily in water during clean up. Powdered and liquid Pectin are not all the same. There are differences between them in the amount you need to add to a recipe, the amount of sugar you need to add to activate the pectin to create the gel. All powdered pectin can be used interchangeably as long as you follow the instructions on the package, for a recipe that calls for liquid pectin a powdered version is NOT interchangeable. Some recipes explain that the liquid version is always added after boiling and then immediately ladled into the sterilized jars. Powdered versions must be added then boiled again for some period of time to activate the gel process. Most recipes that are a “clear jelly” will ask for the liquid version so there is no visible change to the recipe. 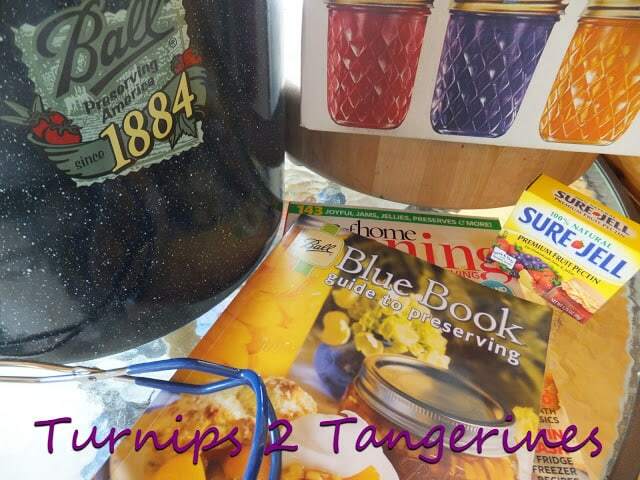 I've been interested in canning for a long time just never had the "guts" to try it. But you have just peaked the interest up more. Just might have to give it a shot this year. I love your pretty canning jars! I can't wait for the beginning of the canning season here. Great post. I am curious about pectin. I see that it is not interchangeable, but I would like to know why.